Caulier has met the DigiKam 1.0 release deadline pretty much down to the day, following the first beta announced in June. 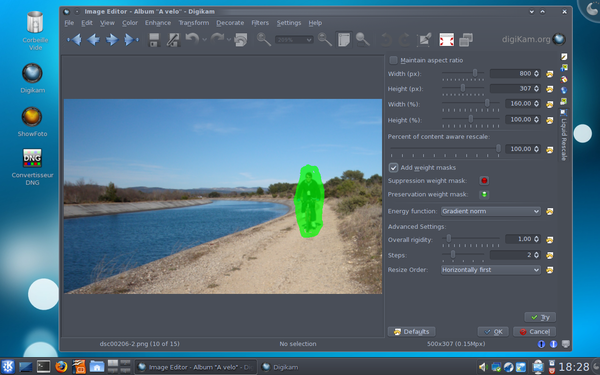 The new DigiKam is not just about the first KDE 4 version of the software, but it also provides numerous enhancements and new features. Since the last KDE 3 version, around 500 bugs were fixed. Among the features are support for the PGF file format, a new first run assistant and a complete rework of the batch queue manager. The new Liquid Rescale tool allows stretching and distorting an image while preserving the size of certain elements (such as people) in it. Original 4:3 image, with a preservation mask for the bicyclist. Details for Caulier's "Merry Christmas" release are in his blog. Most distros currently provide a pre-version of 1.0. To get the stablest possible DigiKam, it's best to refresh to the final 1.0 or wait for package upgrades. Apart from the currrent source code, binaries for Windows should become available soon. Liquid Rescale filter applied to stretch the rest of the image to 16:9.